As a brunette parent of a red-headed son, I understand the importance of a paternity test. After all, why in the hell would I want to spend my few sober hours a day with a kid who isn’t even mine? If you have similar concerns, there’s no longer a need to drive halfway across town to some stuffy doctor’s office. 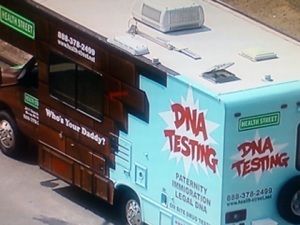 For a few hundred bucks, the “Who’s Your Daddy?” mobile DNA test truck can come right to your doorstep and perform the confidential tests. All they have to do is get a cheek swab from you and your possible child, and in a few days, you’ll know whether you’re either stuck with that kid for a few more decades or will once again taste the sweet nectar of freedom. There is really only one problem with this idea. “Confidential tests” may not be totally accurate because neighbors tend to notice things like a 40-foot RV parked in front of your place with the slogan “Who’s Your Daddy?” emblazoned on it. If they weren’t gossiping before, you know they’re going to start. And, if you’re a kid who’s in school, get ready for a level of teasing that’s going to be damn near suicide inducing. On the plus side, the prank potential for this mobile billboard is nearly limitless. I would pay them a few hundred bucks just to park in front of my brother-in-law’s house so I could get a picture.